Ok so today turned out to be a not so good day for me, and like all not so good days I try do something which would distract me, something i love doing. Hence this post. Nope I don’t want to talk about it. So some months ago I got me an E71 Nokia phone, among other things I was hoping to use it as a music device so I slammed in an 8gb memory card, and was all set but for one factor: 60% of my music collection are in ogg format and nokia default music player does recognize ogg. Sure there are some 3rd party music apps for E71 which can play ogg files out of the box but they all lack the kind of integration which you get with the Nokia default music player. While in confused mode I decided to call up a friend nucco and he gave me the tip about .is_audio_player. Ever since i started a blog i had always wanted a wanted a application which would allow me do my blogging (preferably offline ) without having to use the web browser. One of the reasons for this was because i (as at then) did not have a stable Internet connection and had to go to Internet cafe to do my blogging which wasn’t really convenient. I wanted a way to do my blogging offline and then upload later. Even when i had a stable Internet connection i still prefer to having to use a browser for blogging. 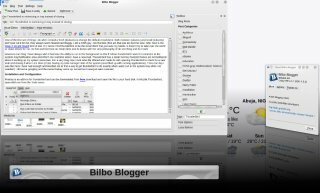 Unfortunately for me most of the blogging applications ( Drivel BloGTK KBlogger gnome-blog) i tried on Linux just didn’t cut it, some didn’t work with wordpress and the once that did weren’t powerful enough or were buggy or just too basic.